Telesat and Blue Origin have signed a multi-launch agreement that paves the way for the New Glenn rocket to play a key role in Telesat’s deployment of the company's global LEO satellite constellation that will deliver fiber-like broadband services anywhere on Earth. With this agreement, the two companies are combining their expertise and have established a strong, working relationship and will collaborate on a range of technical activities to assure cost and performance objectives are achieved throughout the multi-launch program. Telesat’s LEO constellation will leverage the company’s innovative, patent-pending orbital architecture and global priority spectrum rights, as well as the most advanced antenna, digital processing, optical link and manufacturing technologies. Telesat LEO will offer an unsurpassed combination of capacity, speed, affordability, security and resiliency with latency equal to, or better than, the most advanced terrestrial networks. Able to serve the entire globe, Telesat LEO will accelerate 5G expansion, bridge the digital divide with fiber-like high speed services into rural and remote communities as well as set new levels of performance for commercial and government connectivity on land and in key maritime and aeronautical broadband markets, which are among the fastest growing in today’s SATCOM industry. Artistic rendition of the New Glenn launch vehicle in flight. Image is courtesy of Blue Origin. Founded and backed by Amazon founder Jeff Bezos, Blue Origin is developing New Glenn, a reusable heavy-lift launch vehicle that will send people and payloads to Earth orbit and beyond — New Glenn’s massive 7 meter fairing has more than two times the payload volume of the largest fairing in the market today. The rocket is powered by seven BE-4 engines with the capability to deliver 45 metric tons to LEO. Blue Origin expects New Glenn to have its maiden flight in 2021 from Launch Complex 36 at Cape Canaveral Air Force Station in Florida. Blue Origin is also presently launching and landing its fully reusable New Shepard suborbital vehicle taking research and technology payloads to space today and astronauts later this year. Dan Goldberg, Telesat’s President and CEO, said Blue Origin’s powerful New Glenn rocket is a disruptive force in the launch services market which, in turn, will help Telesat disrupt the economics and performance of global broadband connectivity. Telesat and Blue Origin share a vision of leveraging state-of-the-art space technologies and engineering excellence to improve the lives of people around the globe and give customers a significant and sustainable advantage in their own highly competitive markets. Telesat is working with a range of world-class companies to build, deploy and operate our advanced, global LEO network. 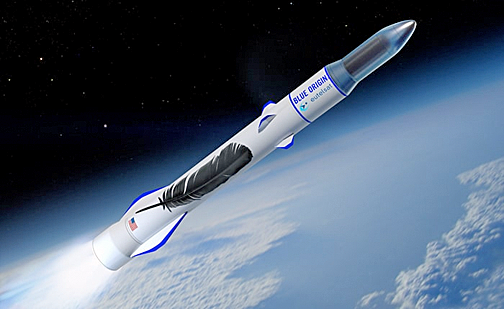 The company is delighted to welcome Blue Origin and their New Glenn rocket to the team. Bob Smith, CEO of Blue Origin, added that the company is honored that Telesat has selected the powerful New Glenn rocket to launch Telesat’s innovative LEO satellite constellation into space. Blue Origin is excited to be partnering with this industry leader on their disruptive satellite network architecture. New Glenn’s 7-meter fairing, with its huge mass and volume capabilities, is a perfect match for Telesat’s constellation plans while reducing launch costs per satellite. Additionally, Telesat and Loon, a subsidiary of Google’s parent company Alphabet, have entered into an agreement under which Loon will deliver a network operating system design that Telesat can use to support its global LEO satellite constellation. 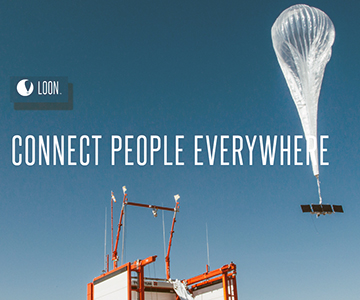 The design will adapt and expand on Loon’s cloud-based, temporospatial software-defined network (SDN) platform that Loon uses today to deliver mobile data services over its fleet of stratospheric balloons. Under the agreement, Loon will adapt its SDN platform design to enable Telesat’s LEO constellation to consistently deliver a fiber-like broadband experience on a global basis to both fixed and mobile terminals. The Loon SDN will be specifically customized for Telesat’s use, giving its innovative LEO constellation a powerful and highly differentiated capability for serving growing commercial and government markets. The effort will result in Telesat having access to a scalable and robust network operating system that Telesat can use to optimize capacity across its global fleet of LEO satellites while minimizing latency and ensuring reliable connectivity to end-users worldwide. The Loon SDN coordinates its balloon-powered internet efforts, which are set for commercial deployment later this year. The SDN schedules, predicts, controls and optimizes the wireless topology, radio resources, and routing of packets across the ground and aerospace segments of non-geostationary networks, which pose unique challenges because of their high degree of mobility. The SDN ensures that data is constantly flowing across the network, even as network nodes change position and orientation. The synergy between stratospheric balloons and LEO satellites comes from a shared characteristic — both are in constant motion relative to the Earth and one another. Because of that, the network challenges presented by Loon’s internet balloons are also present for Telesat’s LEO satellites, making the Loon SDN technology an ideal solution for both. Telesat’s LEO constellation will leverage the company’s global, priority spectrum rights in Ka-band and proprietary LEO architecture to transform global communications. It will offer a combination of capacity, speed, security, resiliency and low cost with latency that is equal to, or better than, the most advanced terrestrial networks. Able to serve the entire globe, Telesat LEO will help satisfy many of the world’s most challenging communications requirements. It will accelerate 5G expansion, bridge the digital divide with fiber-like high speed services into rural and remote communities, and set new levels of performance for commercial and government connectivity on land and in key maritime and aeronautical broadband markets, which are among the fastest growing in today’s SATCOM industry. Erwin Hudson, VP Telesat LEO, stated that Loon’s cloud-based SDN platform is already managing services over the Loon high-altitude balloon network and Telesat is pleased to be working with Loon to have Loon optimize their solution for Telesat’s LEO constellation. Loon has unique experience developing sophisticated network management software that assures delivery of reliable broadband services over highly dynamic networks that undergo constant change. The addition of Loon brings an entirely new set of capabilities to the world-class supplier team Telesat has built for the company's LEO program — capabilities that will give Telesat a powerful competitive advantage in our global broadband service offerings. Alastair Westgarth, CEO of Loon, said that by leveraging the company's expertise to assist in the development of Telesat’s advanced and innovative LEO constellation, the firm sees another opportunity for Loon to pursue the mission of connecting people everywhere by inventing and integrating audacious technology. With billions of people still lacking internet access, there’s an urgent need for multiple approaches to solving this problem. Telesat has an outstanding record of innovation in commercial space communications.